On Saturday, October 17, 1936, Franklin Delano Roosevelt, thirty-second President of the United States, and First Lady, Eleanor Roosevelt, were greeted in Niagara Falls, New York, by at least 40,000 spectators. The purpose of this Niagara visit was to dedicate the newly constructed Hyde Park Stadium. Thousands lined the six-mile route through the city that the President and Mrs. Roosevelt drove through on the way to Hyde Park Stadium. Squads of soldiers from Fort Niagara, National Guardsmen and city and state police guarded the entire distance. The route specifically went through the north end to the south end section of the city to Niagara Avenue and then to Hyde Park. 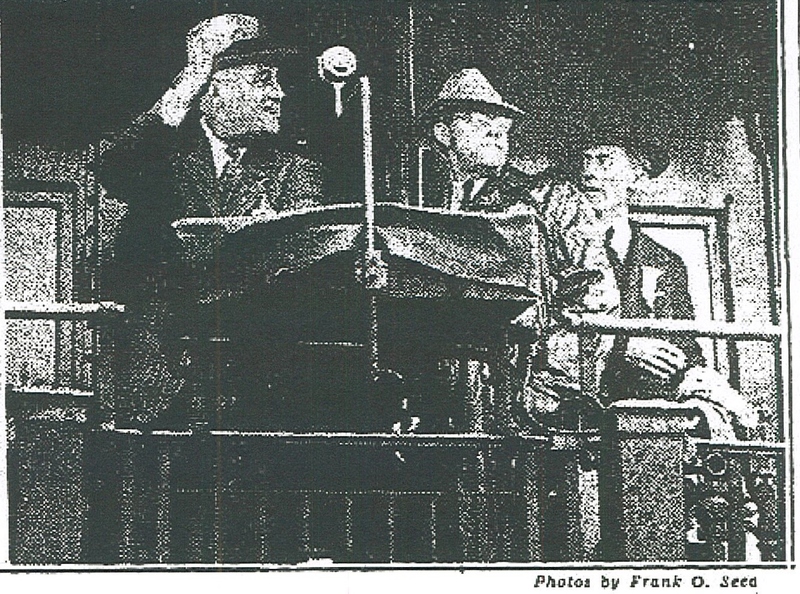 President Roosevelt praised the new stadium and similar public works projects. He explained the government’s works policy and mentioned the cordial relations existing between the United States and Canada–as exemplified in the twin cities of Niagara Falls, New York and Niagara Falls, Ontario. “The government’s policy is to think not only of the practical necessities of public works including water works systems, sewage disposal plants and similar projects but to develop that kind of thing which is useful to us and our children in our recreational life,” he declared. A heavy mist blanketed the stadium. Just before the President’s arrival torrential rain had fallen in Niagara Falls and it fell again after the President departed. The last presidential visit before Roosevelt’s ended in national tragedy. President McKinley spent an entire day in Niagara Falls before leaving for Buffalo where he was killed. Fortunately, Roosevelt had much better luck. One very special little girl, Miss Joanne Muhlbauer, daughter of Mr and Mrs. William Muhlbauer of 420 Twenty-third Street, had the distinct honor of shaking hands with the President. While standing amidst the crowds at the Falls Street railroad station, nestled in her grandfather’s arms, little Joanne was certainly in the right place at the right time. As the President came down the ramp he stopped to smile at the little girl who looked up at him. He shook her little hand and then disappeared into his car. Miss Muhlbauer was only eight months old and was said to be “one of the most fortunate ladies in Niagara Falls.” Her grandmother, Mrs. Swalwell, who was a member of the Democratic city committee from the Fifth Ward, Fifth District, also had the privilege of shaking hands with the President and Mrs. Roosevelt.